We can import sales data from a variety of file sources, including nearly all traditional and digital distributor sales files. Using our data import systems, you can easily avoid the cost and hassle of re-keying sales data from spreadsheets to accounting systems. We ensure that all royalties (e.g. artist, producer, webcast, performance, special market, mechanical, etc.) are calculated for all products sold whether in physical format or digitally delivered. 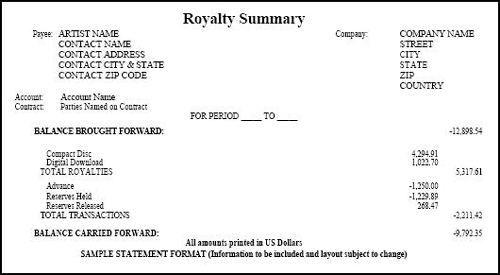 Our Royalty Accounting services include semi-annual or quarterly Standard Record and Mechanical Royalty Statements. Statements reflect the period of sale, territory of sale, units sold, unit rate, catalog number, configuration, opening balances, and royalties earned.